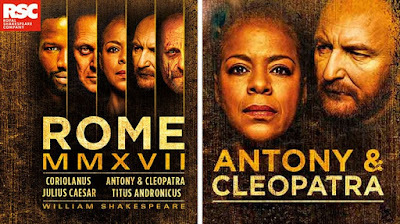 Last night Stuart and I went to see the Royal Shakespeare Company's latest production of Antony & Cleopatra at the Barbican Theatre in London's glitzy Barbican Centre. Directed by Iqbal Khan this Roman tragedy-romance sees Josette Simon's Cleopatra be kittenish, put on silly voices to mock the powerful war-mongers around her, and ride around her palace on her lover Antony’s shoulders. And it’s dignified, too. Khan’s production is in some ways an exercise in high camp: there’s an onstage sauna, some Eros on Antony action, vast cat sculptures and endless Egyptian outfits that are as sexed-up as any Hollywood seamstress could desire. But it also explores the ways that Cleopatra controls her own image, and painstakingly created an aura about her that was capable of leading Rome’s most powerful man astray. The Egyptian scenes spill over with movie-star luxury, turning Antony Byrne’s compellingly gruff, bold Antony into a man bewitched. Back in Rome, all is sterile, presided over by a young Caesar who’s played by Ben Allen with boyish, intelligent rigour. It's a production that emphasizes clarity over invention. Still, artful touches bring out the story’s mix of decadence and fraught political maneuvering. Laura Mvula’s live musical score couldn’t be better, repurposing the military pomp of a brass band into something ethereal and entrancing. A naval battle becomes a delicate dance of model ships, so many toys to delight a queen. By comparison, the drawn-out deaths of the play’s final scenes are astonishingly, shudder-inducingly real.